Wow! 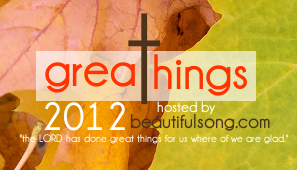 Today is the kick-off of GreaThings 2012! I am looking forward to being blessed and blessing others as well. Flying out west to spend time with a dear friend, taking time to tour her home area, just have time as friends. Spent 4 days with her, took the opportunity to quilt a king-size quilt for her future home. Then spending time with her and her boyfriend when they came into the area for a weekend retreat…so many memories. New friends…college friends, youth, local coffee shop owners, study buddies. Friends near, friends far, friends dear…the list goes on and on. I am blessed to have so many friends that surround me and left me up when the going gets tough, who laugh with me and cry with me. Just sitting down to write this has made me stop and realize how blessed I am. I often used to think of that verse when I was studying biology, it really does remind you how incredible God's creation is. Thanks for sharing! Biology class has just been so great. I always wonder after sitting through lecture, how could one not believe in a God and Creator! Friends can bring out the best in us sometimes. God knew best when He had us meet another new soul, knowing they would change us. Thanks Chantel! Life is full of so many blessings. I have been blessed thus far by the participation of every one!